Ho Ching speakin tae reporters at the Temasek Review annual report press conference in 2009 in Singapore. 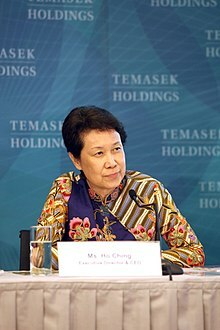 Ho Ching (Cheenese: 何晶; pinyin: Hé Jīng; Wade–Giles: Ho2 Ching1; Cantonese Yale: Hō Chìng) (born Mairch 27, 1953) is the Chief Executive Officer o Temasek Holdings (syne 2002). Ho jyned Temasek Holdings in Mey 2002 as Executive Director an wis appyntit Chief Executive Officer on 1 Januar 2004. Ho first jyned Temasek as Director in Januar 2002 an then acame its Executive Director in Mey 2002. As o 2014, she is leetit as the 59t maist pouerfu woman in the warld bi Forbes. ↑ Jim Rogers (2007-05-03). "Ho Ching - The TIME 100". Time. This page wis last eeditit on 5 August 2016, at 03:11.